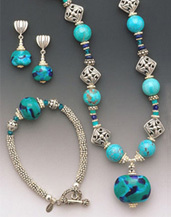 Combining Venetian glass colors of cobalt, turquoise and sky blue with fine silver veins, the artist creates the appearance of a rich turquoise "painted rock". 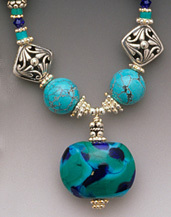 The marbled design is unique with each glass bead created. 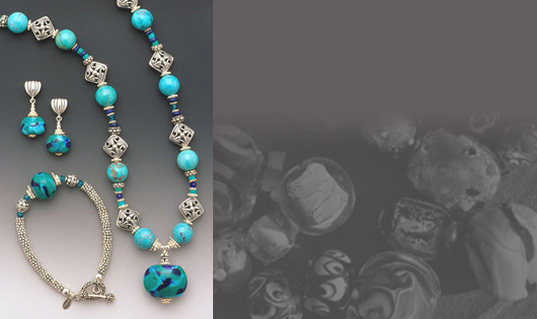 The featured bead of sculpted glass is accompanied by turquoise beads, detailed sterling silver beads and Swarovski crystals. - 18" length. 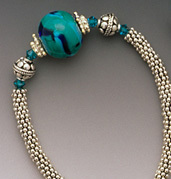 This exquisite timepiece serves also as a wonderfully artistic bracelet. 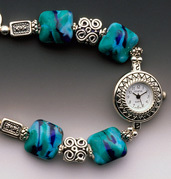 The silver watch face is featured on a bracelet of hand sculpted glass beads accented with sterling silver beads and a sterling silver toggle clasp. 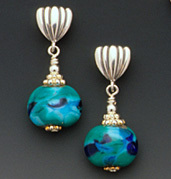 Length 8 ½".